SPI Sea Life Sculpture by San Pacific International. Artifacts Gallery's collection of affordable sea life sculptures will bring the majesty of the ocean to your home environment. Featuring a variety of finishes, these beautiful pieces are sure to become treasured accents for your decor. Sea otters, whales, dolphins, mermaids and sea turtles can be found in our collection. Looking for a stunning table for your beach home? 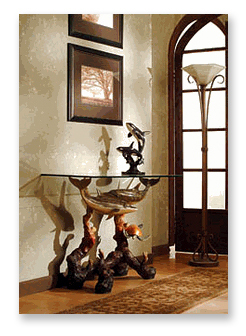 Consider the "Dolphin Sea World End Table" or "Turtle Console Table" to make an impressive impact and set the ocean theme as guests enter.